Electricians with a good reputation at the right price are hard to figure out if you do not have anyone that can recommend you a good contracting service. Therefore, it comes down to research and due diligence on your part to ensure you get the right balance of price and quality. A reputable company will have great reviews. Check out 2E Electrical Reviews page. This is a company in New Zealand that has plenty of good reviews from customers. On their review page they include the name of the person that hired the company as well as the name of the company that hired 2E Electrical for the job. In the image below, you can see that 2E Electrical has a 5-star rating on Google Reviews. This is always a very good sign of a great company. If someone did not like the services provided by this company, they could simply type in ‘2E Electrical’ into Google and leave a bad review. There is nothing stopping people from leaving a bad review, so if you see no bad reviews, this is a good sign of a reputable company. Although, sometimes there will be the occasional jealous competitor leaving a bad review, and it can be hard for the company to get rid of these bad reviews – you need to make your mind up by weighing up all the reviews you see. To look at the Google reviews for the company you are interested in, surf to www.google.com in your country. In the search bar, type in the name of the company and hit enter. You will see the company you are looking for in the Google search results. Next, on the right-hand side, you will see the Google reviews section for the company. In our example, we are using 2E Electrical from New Zealand because they are a re local business to us. In the above image you can see that 2E Electrical also have a Facebook page in the search results. This is a good sign because the company is allowing people to have a voice in their industry. That voice means that anyone can comment on 2E Electrical’s business operations publicly on Facebook. 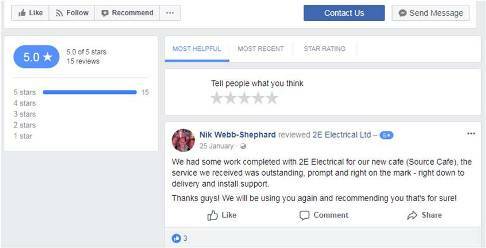 As you can see on further investigation of the 2E Electrical Facebook profile reviews, the company has 15 5-star ratings on Facebook. This is another very good sign of a very professionally run electricians company. Again, as with Google Reviews anyone can leave a review here about the 2E Electrical services. This is completely open to the public, therefore, if you have a Facebook profile, you can leave a review. You will also be able to browse every review left for the company. Make sure you read all the reviews, so you can find reviews specifically related to the type of job that you want completed. Local directories such as Yellow Pages. Here you can see that 2E Electrical have a presence on the New Zealand Yellow pages directory and 1 positive review. So far, breaking down the 2E Electrical business’s reputation online, we have seen nothing but positive reviews. Let’s take a look at wheat the person on Yellow Pages had to say. As you can see, the feedback is very positive. At this stage in your investigation, you can be very safe in the knowledge that 2E Electrical is a safe, professional, and trustworthy company to work with within the Hamilton area of New Zealand. All that is left to do now is for you to decide whether you like the company in person. You have already done your due diligence, and during that process you can see that the company you are researching has left numerous ways for you to get in contact with them. Now it is time to test their sales processes and customer services responsiveness. Once you have booked an appointment for the free quotation, you just have to sit back and wait for their staff to turn up so you can assess their professionalism and quotation.